Haylo Skin & Body, located on the corner of Park Rd and Miramar North Rd, Miramar, has now been in operation for over 25 years. Come and enjoy the relaxed atmosphere in our custom built, award winning salon. We have four treatment rooms, a lovely spacious relaxation room and a fantastic, private spray tan room. 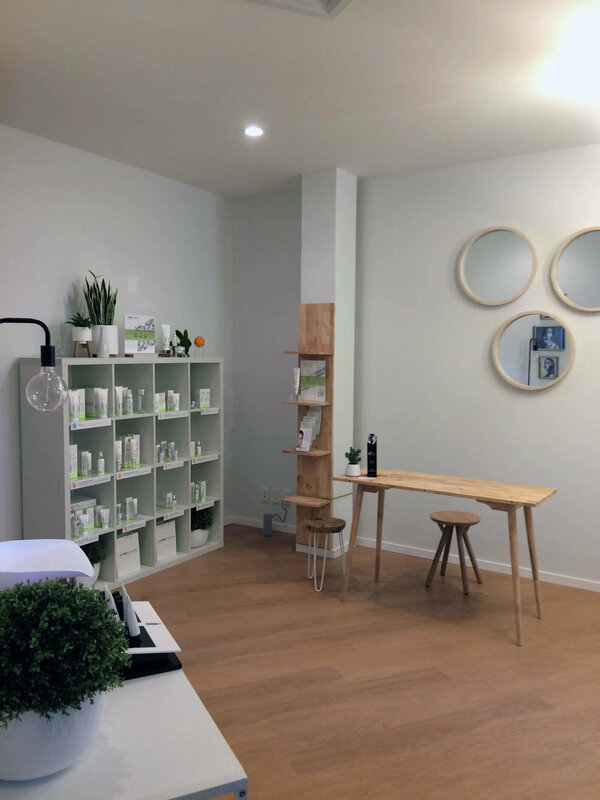 At Haylo we use only top quality professional products such as, Ultraceuticals skincare, Quoi Make-Up, Faby and Gelish nailcare, Ginger & Me body care, Bestow Beauty products and St Tropez spray tan and home care; all to help us give you the perfect treatment results. Call us on 04 388-2025 or email us at info@haylo.co.nz to make a booking, or simply Book Online. If you’re looking for a great experience away from the bustle and stress of the city, come and see us in sunny, friendly Miramar. We look forward to seeing you soon. Our focus is to always give our clients the best possible service. We have built our reputation with integrity, honesty and a desire to constantly improve our knowledge and skills. The therapist/client relationship is truly important to us and something we continually assess and nurture. As a clinic we have grown and evolved to offer the most to our staff and clients. We will always give our clients the best experience we can right from the very first time we meet you. We genuinely want to make a difference so we use products that we truly believe will give you the results you are wanting and, while doing so, we aim to provide a fun, safe and nurturing environment for our team and our guests. Our beauty therapists make all the difference. Our Haylo Skin & Body therapists are experienced and internationally qualified. We are committed to on-going training and continually update our skills and knowledge so we can give you the best guidance on your well-being journey with the utmost integrity. Why do you love working in the Beauty Industry? I love making a difference to how people feel. We have a lot of clients walk in feeling tired, stressed and sometimes flat, and to have a job that can shift someones mood to happy, relaxed and calm is so rewarding. Seeing clients confidence grow too when we have helped them go from, being embarrassed to go out because their skin is so congested, dry or sensitive , to achieving clear healthy skin is so satisfying! To fly or be invisible, I can't decide!!!! What do you love most about working at Haylo? I LOVE our team, our wonderful clients, and our Miramar community. We have a lot of good times at work, never a dull moment. It is so awesome to work with like minded people who have so much passion about the Beauty Industry, and are so hardworking, fun, caring, honest and a little crazy!!!! One Truth, it is AMAAAAAZING! I enjoy making my clients feel good about themselves and getting people into a relaxed zone when they need some time out from their busy lives. I also love that there is always something new to learn in the Beauty Industry. I love the Team and the vibe. We have fun and enjoy each other while we work. I've been at Haylo for 6 years now so it feels a bit like a second home. Bestow beauty oil! This is a daily breakfast habit of mine now to get my skin nourished and glowing. I love working in the beauty industry as I feel very happy to make people feeling relaxed after treatments. It would be a philanthropist to help people in need. Education centres etc. Working with a lovely team and the nice location. I love all of the people I get to see everyday as well as making their day! I would have the super power of all super powers! The power of getting to steal super powers from other people! Haha. The thing I love most about working at Haylo us the team environment. We all get a long so well, support one another and always have a great time. Our social events are always so much fun too! My favourite product has to be the foot peel. It works so well, but be sure to have close toed shoes handy, it really does get all the dead skin off. I love working in the Beauty industry because I love being able to share my knowledge and passion with others and having the ability to help others feel relaxed and happy within themselves. Being able to talk to animals would be amazing. What do you love about working at Haylo? I love working at Haylo because of the amazing team I get to work with and the relaxing positive atmosphere at the salon. My favourite product would have to be the Ultraceuticals mattifying SPF moisturiser, I love that there are different options of SPF moisturisers to keeping our skin healthy and safe from the sun! You are our priority. The time you book is focused on you so we can achieve Haylo’s mission of sharing our knowledge and inspiring you to feel good, inside and out! A huge part of our job is connecting with you, our clients, and wherever possible, we want to bring joy into your day in some way! Either by helping you feel more confident about yourself or nurturing you to help with your overall wellbeing. We completely understand that sometimes you need to change your schedule so if you’re unable to come to your appointment we ask that you reschedule or cancel no later than 48 hours prior to the scheduled appointment. If you cancel no later than 48 hours prior, we’ll happily refund your deposit or, if you reschedule, the deposit can go towards your next appointment. However, if you cancel less than 48 hours before your appointment, unfortunately we will be unable to refund your deposit. So, if you do need to change your appointment for any reason, please give us enough notice. That way we can provide that same, personalised service to someone else who may have been unable to get an appointment.